The Quran itself is a miracle and cannot be imitated by man. 'translator's duty is to distil some of the shades of meaning in the text; the end product is not Quran but just a translation (just as a shadow is merely a shadow), and so long as nothing is misquoted or taken out of context. 'The Qur'an is God's miraculous, matchless message that has been sent to all humanity via His last Messenger. With the Quran, God has shown humanity, one last time, a short-cut to His good pleasure. He has communicated to us about His Essence, Attributes, and Names. He has expressed in the most explicit way, leaving no room for any misunderstanding, His will to be known and recognized in the correct way, to be believed in and worshipped. Almighty God has put emphasis on the duties and responsibilities of believers, while enthusing hearts and agitating souls with His promise for punishment and reward. He has presented the Qur'an as a sign for perfection and completion and as an orbit to rotate around for His good pleasure, while condescending to offer this gift to us as a compliment greater than any that has been or will ever be granted to anyone else' . ALLAH'S Quran, Axial Text of Islam , The True Word of God , God's Personal Letter to Mankind ], "is God's miraculous, matchless message that has been sent to all humanity via His last Messenger. With the Qur'an, God has shown humanity, one last time, a short-cut to His good pleasure. He has communicated to us about His Essence, Attributes, and Names. He has expressed in the most explicit way, leaving no room for any misunderstanding, His will to be known and recognized in the correct way, to be believed in and worshipped. Almighty God has put emphasis on the duties and responsibilities of believers, while enthusing hearts and agitating souls with His promise for punishment and reward. He has presented the Qur'an as a sign for perfection and completion and as an orbit to rotate around for His good pleasure, while condescending to offer this gift to us as a compliment greater than any that has been or will ever be granted to anyone else" . "Having come from the Supreme Throne of God, and originated in His Greatest Name, and issued forth from the most comprehensive rank of each Name, and as is explained in The Twelfth Word, the Koran is both the word of God as regards His being the Lord of the worlds, and His decree in respect of His having the title of the Deity of all creatures, and a discourse in the name of the Creator of all the heavens and earth, and a speech from the perspective of the absolute Divine Lordship, and an eternal sermon on behalf of the universal Sovereignty of the All-Glorified One, and a register of the favours of the Most Merciful One from the viewpoint of the all-embracing Mercy, and a collection of messages some of which begin with a cipher, and a holy book which, having descended from the surrounding circle of the Divine Greatest Name, looks over and surveys the circle surrounded by the Supreme Throne of God" . [Quran - 39:27-28 - Abdel Haleem] "In this Qur'an, We have put forward all kinds of illustrations for people, so that they may take heed-an Arabic Qur'an, free from any distortion." That quotation from Surah 39, Verses 27-28, of the Qur'an was rendered into English by Muhammad A. S. Abdel Haleem, Professor of Islamic Studies at the School of Oriental and African Studies in London. It emphasizes a basic yet far-reaching fact about the holy book of Islam: It was received and recorded in the Arabic language. Muslims believe that the Qur'an is inseparable from the language in which it was revealed, and for this reason, all Muslims worldwide recite it in Arabic, even though today the vast majority of Muslims are neither Arabs nor native speakers of Arabic. Many Muslims also regard the eloquence of the Qur'an as evidence of its divine provenance. A popular story recounts how, in the time of Muhammad, the most famous poet of Makkah converted to Islam after reading one of its verses, convinced that no human could ever produce a work of such beauty. [Quran - 3:7 - Abdel Haleem] "Some of its verses are definite in meaning-these are the cornerstone of the scripture-and others are ambiguous. The perverse at heart eagerly pursue the ambiguities in their attempt to make trouble and to pin down a specific meaning of their own: only God knows the true meaning." Most modern-day "translators" of the Qur'an explicitly engage these issues and explain their particular approach and decisions. While there will never be a definitive Qur'an in any language other than Arabic, these days English readers are able to choose from among a wide selection of careful "interpretations" . [Quran - 3:7 - Umm Muhammad]." "No human being can ever be acquainted with all the knowledge embedded in the Holy Qur'an, for it is the speech of the Almighty, the Praised and the Glorified One, Who has said, "Say: If the sea were ink for the words of my Lord, the sea would surely be consumed before the words of my Lord are exhausted even if We were to bring the like of it to add thereto [18:109] . "It is even more proper to confess one's inability of expressing any of the virtue of the holy Quran, one's words may fall far behind what the holy Quran, in fact, deserves . "Acknowledging the complete impossibility of adequately conveying the meanings of the Qur'an in English or indeed in any other language, Allah, may He be exalted, chose pure, classical Arabic as the linguistic vehicle for His final Revelation to mankind because of its unique capacity of retaining and conveying great depth of meaning in a multi-faceted way which is beyond the scope of any other language, particularly in the debased form which they have arrived in at the time in which we live" . The True Meanings of ALLAH'S Quran are beyond human perception. Only ALLAH, The Exalted Knows The True Meanings of The Quran. Muslim and non-Muslim Scholars agree; QURAN IS UNTRANSLATABLE. MUSLIM BELIEF - "Muslim scholars believe that any translation cannot be more than an approximate interpretation, intended only as a tool for the study and understanding of the original Arabic text" . IMAM SHAFI'I - "Imam Shafi'I affirmed that nothing can compare or compete with the Qur'nic text (in terms of its significance) other than something that is equal to it (i.e., another verse from the Qur'an" . IBN ATIYAH - "The correct opinion, and the one held by the majority of scholars in regard to the Qur'an's inimitability, is that it is due to the Qur'an's syntax and its veracity. This is because the Almighty's knowledge encompasses everything and His knowledge encompasses all forms of discourse. Thus in arranging the Qur'an's wording, the Almighty knew exactly which word was best suited to follow the one before it, and which word best yielded the intended meaning. The Book Of Allah is such that if a word were removed from it and the entire Arabic lexicon were searched for a better word, it would never be found" . ABDALHAQQ AND AISHA BEWLEY - "Acknowledging the complete impossibility of adequately conveying the meanings of the Qur'an in English or indeed in any other language, Allah, may He be exalted, chose pure, classical Arabic as the linguistic vehicle for His final Revelation to mankind because of its unique capacity of retaining and conveying great depth of meaning in a multi-faceted way which is beyond the scope of any other language, particularly in the debased form which they have arrived in at the time in which we live" . MARMADUKE MUHAMMAD PICKTHALL - "It is the belief of traditional shaykhs and the present writer that the Qur'an cannot be translated. Although I have sought to present an almost-literal and appropriate rendering worthy of the Arabic original, I cannot reproduce it's inimitable symphony, the very sounds of which move men to tears and ecstasy" . ARTHUR J. ARBERRY - "Since the Koran is to the faithful Muslim the very word of God, from earliest times orthodox opinion has rigidly maintained that it is untranslatable, a miracle of speech which it would be blasphemous to attempt to imitate. This very characteristic feature - 'that inimitable symphony', as the believing Pickthall described his Holy Book, "the very sounds of which move men to tears and ecstasy" - has almost been totally ignored by previous translators; it is therefore not surprising that what they have wrought sounds dull and flat indeed in comparison with the splendidly decorated original. I have called my version an interpretation, conceding the orthodox claim that the Koran (like all other literary masterpieces) is untranslatable;" . A. R. KIDWAI - "Despite the historical fact that the early Muslim community's stand on the translation of the Arabic text of the Qur'an was ambivalent, as indeed, the general Muslim attitude remains so to this day, the act of translation may be logically viewed as a natural part of the Muslim exegetical effort. However, whereas the idea of interpreting the Qur'an has not been so controversial, the emotional motives behind rendering the Qur'anic text into languages other than Arabic have always been looked upon with suspicion" . YAHIYA EMERICK - "Translation of the meaning of the Qur'an is not the same as the original Arabic Qur'an. You can use the book [Translation] to get at the meanings and the message of the Qur'an, but it is the original Arabic Text where the message truly resides" . STEFAN WILD - Why Translate the Untranslatable? Ritual prayer in Arabic or translated? If we go back to the earliest period of Islam - and I'm now going to talk about the recitation of the Quran in Arabic and the related problems of translating it. At the time of the prophet the partial or complete liturgical recitation of part of the Quran was performed in Arabic and in Arabic only. Recitation of the Quran is at the very heart of the prayer rite. And that is why according to traditional Muslim theology the ritual prayer of the salat that contains as its most important element the first sura must be recited in Arabic and only in Arabic. But already in the first centuries of the Muslim expansion there were dissenting voices. Two of the most venerable religious authorities of Islam taught contrary doctrines. AL-SHAFI'I (died 820 CE) opined that for the ritual prayer to be valid it had to be spoken in Arabic. ABU HANIFAH on the other hand (died 767 CE), equally famous, taught that those new Muslims who did not know Arabic could recite the ritual prayer in a different language. How could a person who had just converted to Islam communicate with God in a lanuage that this person did not understand? We do not know whether that was Abu Hanīfah's reasoning. But in any case according to him reciting the first sura in the ritual prayer in Persian did not make the prayer invalid. Al-Shafiʿī's contrary opinion prevailed in the end but more by a twist of history, than by a better argument. And the element of mystery in reciting the holy text is not necessarily impaired by the fact that the reciter does not completely understand what he is reciting. "Being what it is, there have been many great efforts to interpret the Qur'an. These have employed other additional sources to justify their interpretations. For example, in the explanation of the Qur'an (tafsir) by Tabari, many sayings attributed to the prophet (pbuh) are employed as well as quotes from the Bible. Some translations try to take these sources into account too, however in my opinion the translations which do this tend to distort the meanings of the words of the Qur'an by using other material which is less authentic. This is very dangerous in translation because it sets other material as equal to the Qur'an. That other material can even be easily misunderstood as being part of the Qur'an when, in fact, it is not. An Example is The Translation "The Noble Qur'an" (A Summarized Version of At-Tabari, Al-Qurtubi and Ibn Kathir with comments from Sahih Al-Bukhari By Dr. Muhammad Taqi-ud-Din Al-Hilali, Ph.D. Dr. Muhammad Muhsin Khan ). This one doesn't actually change the translation as such but it adds large sections in brackets within the translation within which are meanings derived from classical commentaries. This confuses the text of the Qur'an with text from other sources. Usually, text in brackets within a translation is used to give some implied word which is missing, but the meaning of which is clearly in the Qur'an. This is the way it is used in pretty much all translations" . [PICKTHALL] "In the name of Allah, the Beneficent, the Merciful"
[YUSUF ALI] "In the name of Allah, Most Gracious, Most Merciful"
[ASAD] "In the name of God, The Most Gracious, The Dispenser of Grace"
[ABDEL HALEEM] "In the name of God, the Lord of Mercy, the Giver of Mercy!" [TAQI USMANI] "With the name of Allah, the All-Merciful, the Very-Merciful." [UMM MUHAMMAD] "In the name of Allah , the Entirely Merciful, the Especially Merciful." 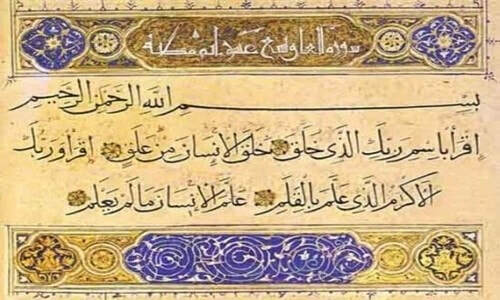 [KAMAL OMAR] "With the name of Allah - the Bestower of unlimited mercy, the continuously merciful"
show that Scholars are NOT UNANIMOUS even in the rendering of Quran [1:1], let alone the whole of The Noble Quran which contains 6236 Noble Verses. "And when you said, `Moses! (we are weary of one kind of food so) we will not at all remain content with one and the same food, pray, therefore, to your Lord for us that He may bring forth for us some of that which the earth produces, of its vegetables, of its cucumbers, its corn, its lentils and its onions.' He (- God) said, `Would you take in exchange that which is inferior (- delicious food) for that which is superior (- the realisation of the noble object of your life)? (If this is so) then go to some town and you will certainly have (there) all that you have demanded.' And lo! it so happened, they were smitten with abasement and destitution and they incurred the displeasure of Allah. That was because they denied the Messages of Allah and sought to kill His Prophets unjustly and that was because they disobeyed and had been transgressing." COMMENT: Respected Scholar Translates Misr (any town), Moeinian renders the Noble Verse as ALLAH'S Command to the followers of Moses (pbuh) to conquer Jerusalem whereas Rahman Omar is of the view, the exchange is between God and Followers of Moses and other Translators feel the exchange is between Moses and his followers. Given the Historical background of the Children of Israel, rendering by respected Scholar Asad, appears to be faithful. "He it is Who has revealed to you this perfect Book, some of its verses are definite and decisive. They are the basic root (conveying the established meanings) of the Book (- Ummal Kitab) and other (verses) are susceptible to various interpretations. As for those in whose hearts is perversity follow (verses) that are susceptible to different interpretations, seeking (to cause) dissension and seeking an interpretation (of their own choice). But no one knows its true interpretation except Allah, and those who are firmly grounded in knowledge. They say, `We believe in it, it is all (- the basic and decisive verses as well as the allegorical ones) from our Lord.' And none takes heed except those endowed with pure and clear understanding." Respected Scholar Asad's rendering is unequivocally clear and is consistent with The Message of The Quran and The Teachings of The Prophet. "Men are the protectors and maintainers of women, because Allah has given the one more (strength) than the other, and because they support them from their means. Therefore the righteous women are devoutly obedient, and guard in (the husband's) absence what Allah would have them guard. As to those women on whose part ye fear disloyalty and ill-conduct, admonish them (first), (Next), refuse to share their beds, (And last) beat them (lightly); but if they return to obedience, seek not against them Means (of annoyance): For Allah is Most High, great (above you all)." [Sunan Abudawud, Book #11, Hadith #2138] "Narrated Mu'awiyah ibn Haydah: I said: Apostle of Allah, how should we approach our wives and how should we leave them? He replied: Approach your tilth when or how you will, give her (your wife) food when you take food, clothe when you clothe yourself, do not revile her face, and do not beat her." Sunan Abudawud, Book #12, Hadith #2220] "Narrated Aisha, Ummul Mu'minin: Habibah daughter of Sahl was the wife of Thabit ibn Qays Shimmas He beat her and broke some of her part. So she came to the Prophet (peace_be_upon_him) after morning, and complained to him against her husband. The Prophet (peace_be_upon_him) called on Thabit ibn Qays and said (to him): Take a part of her property and separate yourself from her. He asked: Is that right, Apostle of Allah? He said: Yes. He said: I have given her two gardens of mine as a dower, and they are already in her possession. The Prophet (peace_be_upon_him) said: Take them and separate yourself from her." It would appear that the rendering by respected Scholar Emerik "separate from them" is consistent with the Message of The Quran and the Teachings of The Prophet (pbuh) of Islam. COMMENT: Renderings by respected Scholars Ghali, Sarwar and Rahman Omar, disregard ALLAH'S Limitless Knowledge, Glory and Power from amongst HIS Attributes and produce a translation based upon their personal thoughts rather than the Divine Text. Scholar Rahman Omar even attributes (False Prophet). Rendering by respected Scholar Marmaduke Muhammad Pickthall appears to be faithful in intent, content and expression. "And (as for) the man who steals and the woman who steals, cut off their hands as a punishment for what they have earned, an exemplary punishment from Allah; and Allah is Mighty, Wise." "As to the thief, Male or female, cut off his or her hands: a punishment by way of example, from Allah, for their crime: and Allah is Exalted in power." The crime of Theft (Stealing) is a REVERSIBLE Crime. "Nor should those who conformed to Islam go forth all at once to the Messenger, but only a group from each community should go to learn from him practical divinity and jurisprudence and convey back such divine knowledge to their people and caution them against provoking Allah's indignation that they may heed." COMMENT: Respected Scholars Ali Unal and Asad are of the view that the Command [9:122] is to restrain believers from going to war all together instead leave a party of them behind to gain knowledge of Faith, which they, then can share with their returning Brethren. Whereas respected Scholar Sarwar holds that it is not necessary for all believers to become Specialists in Religious knowledge. Respected Scholar Al-Muntakhab is of the view that not all the Believers should go, together to The Prophet (pbuh) for perfecting the understanding and practice of Faith, instead a small party should go to The Prophet (pbuh) and upon their return from The Prophet (pbuh), they should then share their knowledge with those who did not go to The Prophet (pbuh). Al-Muntakhab's rendering appears to be more appealing. "So verily, you (O Muhammad SAW) cannot make the dead to hear (i.e. the disbelievers, etc. ), nor can you make the deaf to hear the call, when they show their backs, turning away." "(O Beloved!) Surely, you make neither the dead (i.e., the disbelievers deprived of the vitality of faith) hear your call nor the deaf (i.e., deprived of hearing the call of truth) whilst they are getting away (from you) turning their backs. *"
COMMENT: Respected Scholars Hilali & Khan, Raza Khan and Qadri, claim "dead" mean unbelievers. Such renderings are understood to provide justification for Grave Worship. Rendering by respected Scholar Asad appears to be clear and faithful. The rendering, "dead cannot hear" also draws support from Quran and Ahadith. [Quran - 35:14 - Shakir] "If you call on them they shall not hear your call, and even if they could hear they shall not answer you; and on the resurrection day they will deny your associating them (with Allah); and none can inform you like the One Who is Aware." [96:1 - Abdel Haleem] "Read! In the name of your Lord who created:"
[96:1 - Muhammad Ghali] "Read: In the Name of your Lord Who created,"
[96:1 - Maulana Ali] "Read in the name of thy Lord who creates"
[96:1 - Laleh Bakhtiar] "Recite in the Name of thy Lord Who created." COMMENT: If one was to study Haleem, Ghali and Ali Translations on their own, it would imply that the Prophet (pbuh) was Literate and was asked by Angel Jibril to read out a written Message. Whereas ALLAH, The Exalted, has informed mankind [7:158] that the Prophet (pbuh) was Unlettered (Illiterate). This is further confirmed by the History. Immediately after Prophet's death (pbuh), the Companions did not carry out any searches for any heavenly sheets which Angel Gabriel might have given to the Prophet (pbuh) for reading nor did they search for any iPad which Angel Gabriel might have left behind for all to read. Instead, the Companions relied upon the memorised Quran (oral transmission) and they collected all materials, palm leaves, sheets of leather, shoulder blades of large animals and whatever else had been used for writing the revelations as they were revealed to The Prophet (pbuh) and dictated by the Prophet (pbuh), during his Prophethood. The result was the Compiled Quran which is now widely known as Uthmanic Recension. Thus it is clear that the rendering of [96:1] by Laleh Bakhtiar is consistent with the Message of the Quran and the History of Islam. "... And no one knows its [true] interpretation except Allah...."
No human being can comprehend and convey with power, style, expressiveness and inimitability of The Divine Writ [ The Creator's Words]. Human beings are, The Creator's Creation and as such it is not within their capabilities to understand ALLAH'S Words to the same extent as ALLAH, The Exalted. The claimed Translations of The Holy Quran, are indeed the translations of the meanings of The Quran [in short TMQ], as understood and rendered by individuals, to the best of their understandings, ability and possible sectarian or intellectual bias. Only ALLAH, The KNOWER of all, Knows The True Meanings of The QURAN.